How do I clean the feeding roller? A test card will print. Turn on the power and switch from Normal Mode to User Mode. Press the Menu Key until [Cleaning >>] appears and then press the EXE Key. Remove the cards from the Card Case and then press the EXE Key. If cards are loaded, [Remove Cards] appears. When the cards have been removed, [Push EXE (NEXT)] appears. [Set Cleaning Card] appears when the Cleaning Card is loaded. Remove the protection sheet from the sticky surface of the Cleaning Card, and then load it with the sticky surface face down. When the Cleaning Card is loaded, [Push EXE (Start)] appears. The Cleaning Card is pulled into the printer and cleaning starts. The Cleaning Card comes out of the Card Ejection Slot 1 when cleaning is completed. Remove the Card Case. Grip the Card Case by the ridges on its side and pull it as indicated by arrow in the illustration. Wipe the roller clean. Use a soft cloth and very pure alcohol to wipe the roller clean. Turn the roller as you wipe it to clean it in the direction of an arrow. Check that the power cable is correctly connected to the printer and to a working electrical socket. 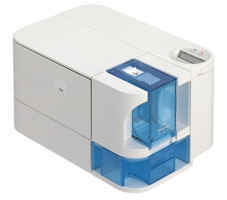 Make sure you are using the power supply unit supplied with the printer. Remove cards from the Card Case. Open the Front Cover, and then rotate the Ejection Dial to the left. Jammed cards are ejected.